In the wikipedia entry for “ballad” there’s the image with caption to the left. Am I weird for finding that just really, really, funny? I start having these weird flashbacks to lots of pink hair,screaming weirdos, and Every Rose Has Its Thorn. Am I the only one who feels that the fashions and styles of the 70s and 80s were just way stranger than those of the 50s and 60s? Or is it just that the 50s and 60s are so far back that we’ve forgotten their own variant of Cherry Pie? Something that has been nagging me about the recent paper by Reich et al. which models Indian populations as a hybridization event between two ancestral groups, “Ancestral South Indians” (ASI) and “Ancestral North Indians” (ANI). As a reminder, the ANI seem to have been rather like Europeans in their allele frequencies, or at least far closer to Europeans than they were to the ASI (it seems that they compared ANI with Western Europeans). This is interesting. They found in the populations surveyed that the low bound for ANI was 40%, the high ~80% (in the supplements they included some Pathans and Sindhis from the HGDP, and that’s where that number comes from). The ~40% low bound for ANI rather surprised me. The populations which they sampled included South Indian tribal groups. In other words, these were the groups arguably least affected by what we term Hinduism and Indian culture (their status as “tribals” as opposed to lower caste or outcaste was generally a function of the fact that they rejected integration and assimilation into mainstream Indian culture and isolated themselves both geographically and in terms of their customs). Just seems weird that these groups would be so ANI. 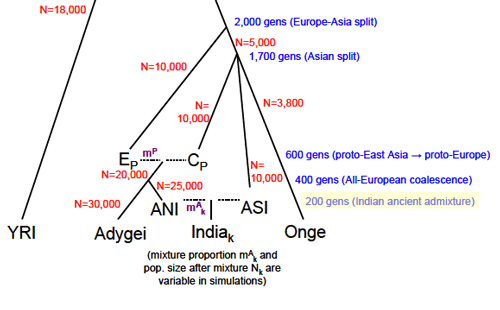 For a few weeks now Greg Cochran has been asking if I saw something in the paper above about when the admixture between ANI and ASI occurred, or at least if there was a hint about when the authors think it occurred. I said no, there are only hints. I was wrong, I skimmed over the supplement too quickly, they assume 200 generations ago as a parameter in a model they use for simulations. Bingo. Just click the image to the left, and look at the lower right. 200 generations = 5,000 years ago, assuming 25 years for generation time. Let’s assume that a South Indian tribal group is a small deme of ASI surrounded by a very large (infinite) deme of ANI for 200 generations. If I assume a constant outmarriage rate of 0.25% per generation (1 out of 400) then at the present time you’d have the tribal group being ~40% ANI. In the parenthesis is the frequency for the derived (European-like) variant of SLC24A5. The data sets were the same, from the HGDP, though the ancestry estimates used only 10 and 15 of the approximately 50 of each group respectively. There’s a suspicious correspondence here. The lowest frequency of the derived variant of SLC24A5 I’ve seen for a South Asian population is ~30% for Sri Lankan Tamils, with ~50% for Sri Lankan Sinhalese. Remember that a reasonable low bound for ANI for South Asian groups is on the order of 40%. But what about my contention that other European-like pigmentation alleles don’t fit because the phenotype isn’t what you’d expect. You can look at a blue vs. brown eye variant of OCA2 in the HGDP. Another eye color variant, HERC2. And here is a variant of TYR which causes light skin. The interesting point would be to look at the Indian samples, but I don’t have really good proxies for that (in one paper which surveyed Indian Americans various language groups ranged from 70-100% in derived SLC24A5 frequency, but it is very difficult to imagine that these correspond well to many groups in the Reich paper. Specifically, it’s biased toward higher status/caste groups). I might have spoken too soon, though it still seems to me that something is off. Perhaps Europeans changed after ANI left. Or perhaps ANI changed when it arrived in India. One recent data point which I find curious is that a paper just came out which suggests that populations of the Andronovo culture in Trans-Siberia, which is assumed to be the precursor to the Indo-Iranians, seem to resemble modern day Russians in pigment phenotype. At least judging from the genes extracted and sequenced. Since his resignation from the university in 1990, however, Horn has changed his tune. Once a staunch Darwinist and tenured CSU anthropology professor, Horn has devoted the last 19 years of his life to the study of alternative theories of human origin. After receiving a doctorate in anthropology from Yale University and while teaching at CSU, Horn focused his energies on the study of the evolution of non-human primates, his wife Lynette Horn said. He now advocates the theory that modern man is not the result of a natural process of evolution, but that evolution was artificially aided by reptilian extraterrestrials. The reptilians bred mankind as servants and continue to rule the planet today, Horn said. Reptilians have manipulated perceptions of world history and hold power over humankind through their influence over an elite and powerful group of humans, known as the Illuminati, Arthur said. Throughout human history, the reptilian beings have been recorded as dragons or gods. Thought it was a joke, but it looks real. 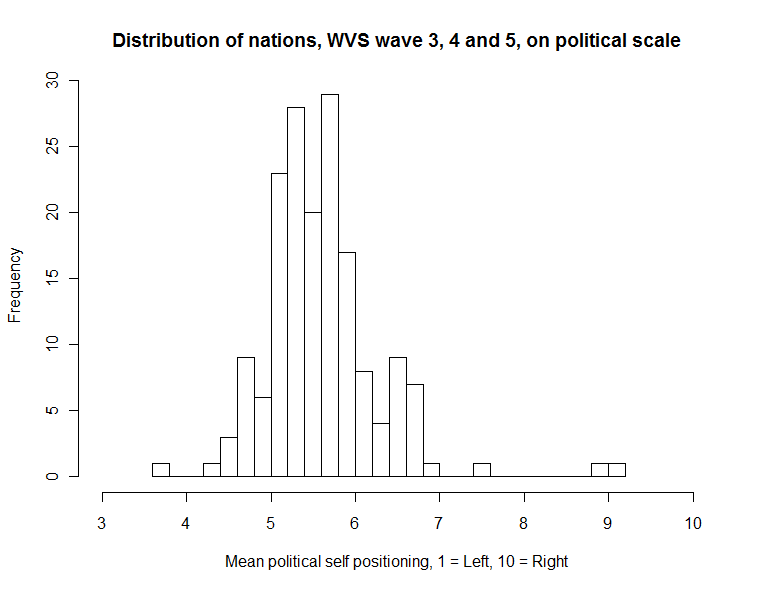 As you can see, the central tendency just a bit to the Center-Right. The median value in the data set is 5.6 (standard deviation 0.68). 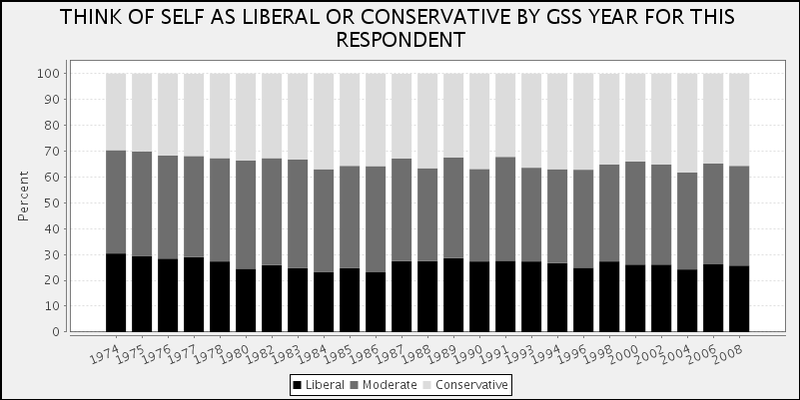 No idea if this means anything, but I did wonder if sometimes there’s a human cognitive bias to perceive oneself as “conservative” because of risk-aversion, but these results don’t seem to be very strong (I’m sure some of the results, such as Vietnam, are due some strange quirks of phrasing which didn’t translate well). Here’s a table of the data points…. Posted in Uncategorized8 Comments on Center-Right world? The Spittoon points to a new paper, Drawing the history of the Hutterite population on a genetic landscape: inference from Y-chromosome and mtDNA genotypes, which I’ve been meaning to look at more closely. Unlike some attempts to use genetics to illuminate questions about the human past here the historical record is rather complete. The 16th century was the high tide and maximal efflorescence of German Protestantism. Not only were vast swaths of what we think of as redoubts of German Catholicism in the Austrian lands brought into the Protestant fold, but the diversity was also at a peak, as the religious status quo was in flux and indeterminate. In the 17th century the Hapsburg Emperors won back the Austrian lands for the Roman Catholic Church,* while Lutherans and Calvinists began turning on the smaller radical sects, generally Anabaptists, in their midst. Groups like the Amish and the Hutterites are echoes of that time, taking root and flourishing in the United States because of its laissez-faire attitude toward religious belief and practice. The Hutterites are also of note because for a long time they were reputedly the highest fertility population in the world. That explains why their numbers have increased by a factor of 30 in the past 150 years, and also points to why they’re of genetic interest. Like many sects Hutterites don’t accept many converts, so their growth is due to their own fertility. Additionally, the history of the Hutterites in Europe seems to be one of bottlenecks due to persecutions. It’s a nice way to see if what one assumes would happen with fluctuating populations did happen when it comes to the genomes of populations. As expected the Hutterites are of Central European origin. In any admixture model where the two parent populations were Central and Eastern European, the Hutterites are 80% Central European. But, their mtDNA and Y chromosomal lineages are a restricted subset of the parental populations, and they exhibit a great deal of genetic novelty. I think this is visually obvious when you look at the Y & mtDNA phylogenies of Hutterites within the context of Central & Eastern European populations. Note how concentrated the Hutterites are in particular branches; they’re subsets, but only a slice. There’s something cool about Canada, I just found out that Alberta is the only large region of permanently inhabited human territory which lacks brown rats. One thing you have to remember is that the brown rat only began spreading within the last 1,000 years (in the process displacing the black rat), and it seems to have arrived in the British Isles only within the last two to three centuries. North America did not have the rat until Europeans arrived, and it didn’t show up in Alberta until 1950. At that point the government attempted an eradication program. Apparently this can work because there aren’t ecologically congenial corridors for the rats to constantly reappear through migration. Posted in Uncategorized2 Comments on Alberta has no rats! 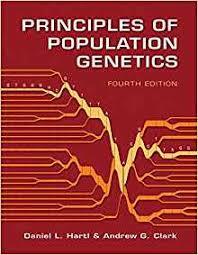 Culture-gene coevolutionary theory posits that cultural values have evolved, are adaptive and influence the social and physical environments under which genetic selection operates. Here, we examined the association between cultural values of individualism-collectivism and allelic frequency of the serotonin transporter functional polymorphism (5-HTTLPR) as well as the role this culture-gene association may play in explaining global variability in prevalence of pathogens and affective disorders. We found evidence that collectivistic cultures were significantly more likely to comprise individuals carrying the short (S) allele of the 5-HTTLPR across 29 nations. Results further show that historical pathogen prevalence predicts cultural variability in individualismâ€“collectivism owing to genetic selection of the S allele. Additionally, cultural values and frequency of S allele carriers negatively predict global prevalence of anxiety and mood disorder. Finally, mediation analyses further indicate that increased frequency of S allele carriers predicted decreased anxiety and mood disorder prevalence owing to increased collectivistic cultural values. Taken together, our findings suggest culture-gene coevolution between allelic frequency of 5-HTTLPR and cultural values of individualism-collectivism and support the notion that cultural values buffer genetically susceptible populations from increased prevalence of affective disorders. Implications of the current findings for understanding culture-gene coevolution of human brain and behaviour as well as how this coevolutionary process may contribute to global variation in pathogen prevalence and epidemiology of affective disorders, such as anxiety and depression, are discussed. It’s Open Access so you can look at their regressions yourself. 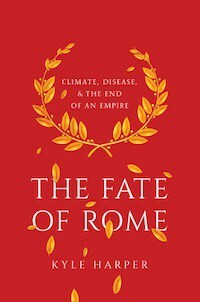 The association with pre-modern levels of pathogens is a strong point for me, these sorts of biological factors would result in a consistent “push” over long periods of times which culture itself might not have. The agricultural civilizations of Asia were always going to be rich ecologies for infectious diseases. So it would be interesting to look at the frequencies of the S & L alleles on a finer scale; for example, in the islands of Japan. Though that case I suspect that lower-density areas would have had so much migration that selection wouldn’t have time to maintain different allele frequencies. There is a famous anecdote inspired by Euler’s arguments with secular philosophers over religion, which is set during Euler’s second stint at the St. Petersburg academy. The French philosopher Denis Diderot was visiting Russia on Catherine the Great’s invitation. However, the Empress was alarmed that the philosopher’s arguments for atheism were influencing members of her court, and so Euler was asked to confront the Frenchman. Diderot was later informed that a learned mathematician had produced a proof of the existence of God: he agreed to view the proof as it was presented in court. Euler appeared, advanced toward Diderot, and in a tone of perfect conviction announced, “Sir, (a + bn)/z = x, hence God exists–reply!”. Diderot, to whom (says the story) all mathematics was gibberish, stood dumbstruck as peals of laughter erupted from the court. Embarrassed, he asked to leave Russia, a request that was graciously granted by the Empress. The second law of thermodynamics talking point is an unsophisticated descendant of Euler’s gambit, while William Dembski’s whole career is a homage to the trick. In regards to the shenanigans that Goertzl refers to, you can go to UC Berkeley’s GSS interface, and after reading the documents, “massage” the outcomes yourself. I do think that econometric methods are still useful tools, their frequent misuse shouldn’t lead us down the path to epistemological nihilism. Many use the law to further their own selfish ends and pervert its intent, but that doesn’t mean that the general idea of an objective legal framework has to be discarded. Specifically, I think the Cowles Foundation has done some worthwhile work (e.g., showing that stock newsletters add no value). Dr. Thomas Mailund has posted a YouTube interview of Svante Paabo. Looks like the previous post was off-base, though I’m not really totally sure. I show that Protestants like Israel; Midwesterners not so much, at Secular Right. Also, many nations are getting more religious, but young people are still less religious, at Gene Expression Classic.